Benidorm continues to attract holidaymakers in their millions with many returning to the top Costa Blanca resort time after time. Its gorgeous sandy beaches, balmy weather throughout the year, great entertainment, bargain nights out and theme parks being among its many attractions. It’s also a great resort to wander around with each area having its own distinct charm. You can stroll along the beaches and gaze up at some of the highest skyscrapers in Europe of various colours glistening in the bright Benidorm sunshine. The two best-known beaches in Benidorm are Playa Poniente and Playa Levante. You can walk from one to the other with ease, stopping off at the iconic Balcon del Mediterraneo which separates the beaches and head into the old town for a bite to eat or for shopping. Your walk could end with an invigorating trip up to the Benidorm Cross to see the sunset or a lively night out in the famous British Quarter with its fabulous bars, discoes, karaoke and tribute bands. Serious sunseekers may like to start at Levante beach, which is the best beach for the morning sun, and finish at Poniente to enjoy the afternoon rays and the sunset. 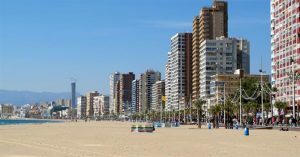 Both Poniente and Levante beaches offer long stretches of golden sand with sunbeds to make the most of the beautiful Benidorm weather whatever the season. At Poniente, you can stroll by the seafront for some or all of its five kilometres along the Avenida Vicente Llorca Alos towards the iconic Balcon del Mediterraneo. 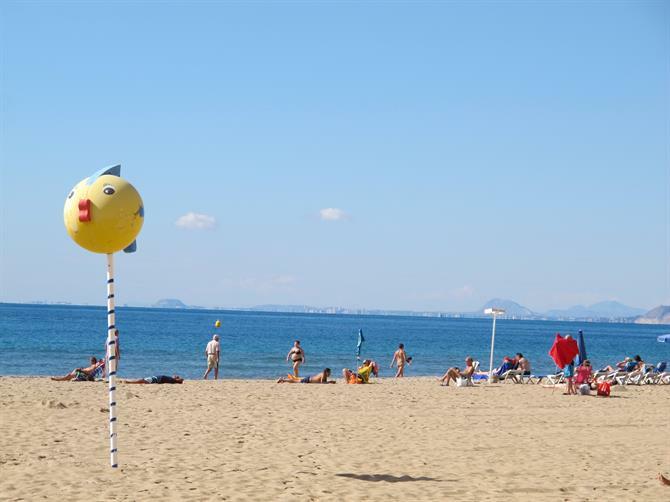 You’ll notice many Spanish couples and families also enjoying a walk along Poniente beach as it’s a popular spot for a slow stroll and a coffee. 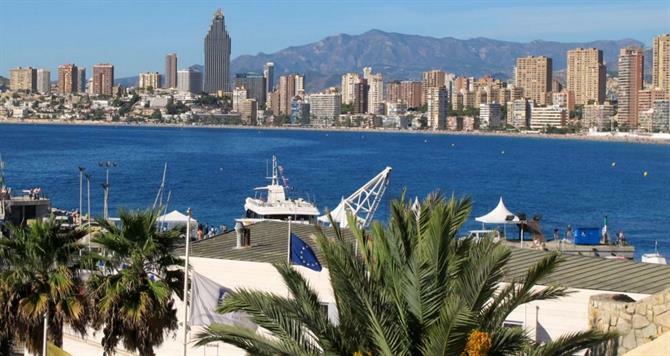 Despite many people’s impression of Benidorm as being no more than Blackpool with sunshine, it’s very popular with holidaymakers from across Europe including many Spanish tourists..
You will also find many Spanish restaurants and bars alongside Poniente beach. In the mornings, don’t be surprised to find groups of people joining exercise classes on the sand. The seaside promenade gets even more crowded as you reach the pretty Parque de Elche which is home to many pigeons and white doves. 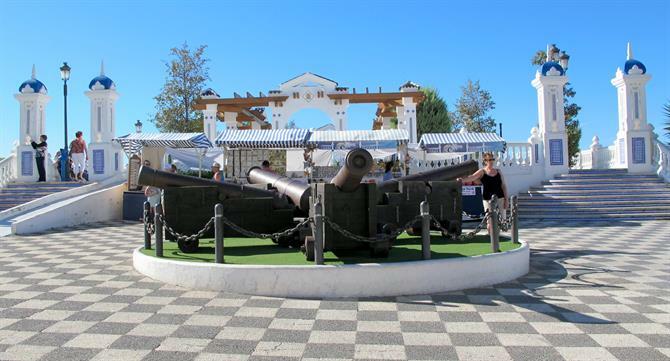 It’s a popular place for having a few minutes’ peace and quiet or letting the children play on the slides and swings. The palm trees provide much-needed shade during the long, summer months too. If you aren’t brave enough to join the groups keeping fit on the beach, there is outdoor exercise equipment in the Parque de Elche for you to keep toned if you feel energetic enough. Half way along the promenade, it is worth taking a detour to visit the Gran Hotel Bali in Calle Luis Prendes, which dominates the Benidorm skyline and is the highest hotel in Europe at 186 metres tall. You can grab the lift taking you up the outside of the building to the 45th floor where you can get out to enjoy the panoramic views of Benidorm’s beaches and the mountains in the background. The emblematic Balcon del Mediterraneo is a former fortress between the Poniente and Levante beaches which is a favourite spot to enjoy views over both beaches and to view Benidorm’s fabulous skyscrapers in all their glory. The steps are pretty heavy going from Poniente beach or you can skirt around the Balcon to approach it from Levante beach. This is a pretty square lined with cafes for a coffee or meal or to have your photo taken by the cannons guarding the square or to visit the charming St Jaime church with its traditional blue tiled dome. Make sure you have your camera or smartphone with you to take pictures as the iconic viewpoint has been voted one of the most picturesque in all of Spain. Behind the Balcon del Mediterraneo is Benidorm’s old town, famous for its nightlife, shops and tapas bars. If you’re looking for a taste of traditional Spain in Benidorm, you are most likely to find it in this district with its cobbled, narrow streets and traditional squares. The old town is great for tapas at lunchtime or to enjoy fabulous nightlife, including first-class drag acts, cabaret shows and gay bars. In and around Calle Santo Domingo, you’ll find several traditional tapas bars where you can sample tasty Spanish snacks such as meatballs, sardines, garlic prawns, Spanish ham or omelettes. If you are new to Benidorm, either eat at or take a peek inside Cerveceria Gambrinus. As well as offering a long list of tapas dishes and paellas, the walls inside are lined with photos of old Benidorm when it was a sleepy fishing village. In the nearby indoor market, you can stock up with tasty ham, cheese, oven-baked bread and fruit to make your own beach picnic. At the fish stalls, you will find a tremendous variety of fish and shellfish, the likes of which are rarely seen in the typical supermarket in Britain. Whatever the season, you’ll find plenty going on at Levante beach. Even in winter, you’ll find it’s possible to sunbathe or play beach games on the golden sand – some hardy holidaymakers will even be brave enough to take to the waters! Alongside the beach is a lovely promenade lined with bars, cafes and restaurants so you can have a rest or soak up the sea views. Heading towards the English Square at the far end of the beach, you’ll find many bars serving English beers and food. This is also a good place to pick up bargain drinks and to enjoy entertainment such as karaoke or live acts in the afternoons as well as the evenings. Before heading for the famous Benidorm nightlife, you may want a short detour up to the Benidorm Cross – another icon of this top holiday resort. It will take about 45 minutes to climb up the Sierra Helada mountain to the Cross so make sure you’re well prepared with sun cream, water and sensible shoes. The original wooden cross was put in the Sierra Helada natural park about 55 years ago by Catholic friars. Many people take the walk up to the replacement cross to reflect on loved ones or simply to enjoy the majestic views over Benidorm. 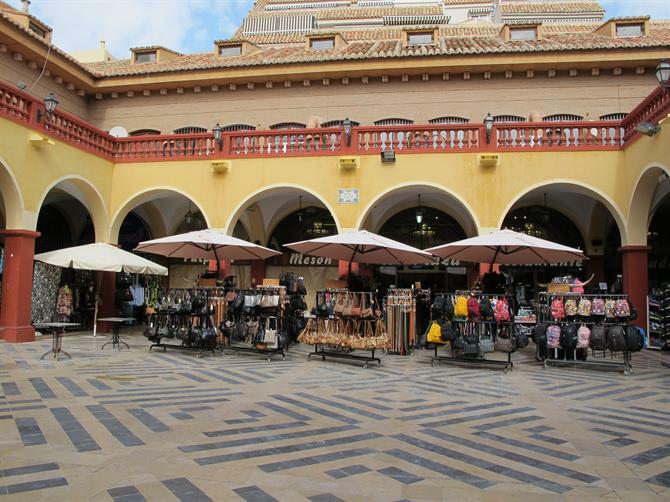 Fans of the Benidorm TV comedy will find the English Square looks very familiar. In and around Calle Gerona, Ibiza and Avenida de Mallorca, just off Levante beach, are many bars and restaurants, plenty of which offer British beer and food as well as live music including fabulous tribute bands, cabaret acts, karaoke and plenty of action. 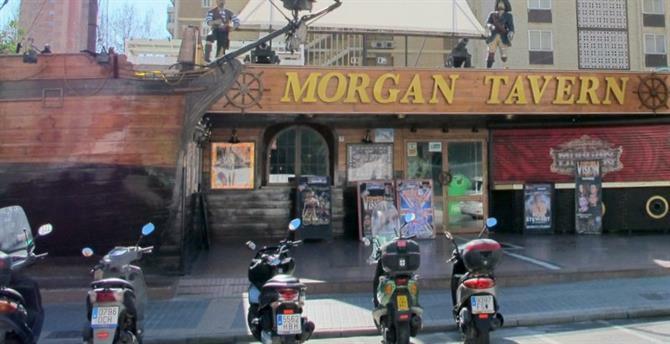 Morgan Tavern is a top place to go for live shows and it features heavily in the Benidorm TV comedy. 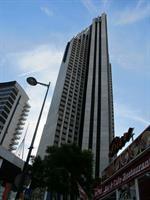 This entry was posted in Beach wear, Benidorm, Children, Fiestas, General information by neville. Bookmark the permalink.